This morning I went for a ride on one of our local trails I seldom ride on. It is a rails to trails trail called the Pufferbelly Trail (named after the steam locomotives which used to run on this railroad track). It is a really nice trail and rather busy (popular), but it is far away from me and short in length … only one mile is completed so far and not connected to any of the other trails at this time (other than a two mile loop around an adjacent YMCA and farm property). It is part of a rails to trails project which when completed (if it ever is) will be a very long trail … approximately 80 miles is what I understand. I don’t think they have a name for this planned trail yet. When dealing with the government there is always so much red tape and delay in trying to get anything done. Fort Wayne and Allen County’s portion will be about 13 miles long and it will be known by this name. They have “broken ground” earlier this summer on the next 1.25 mile section to the north. 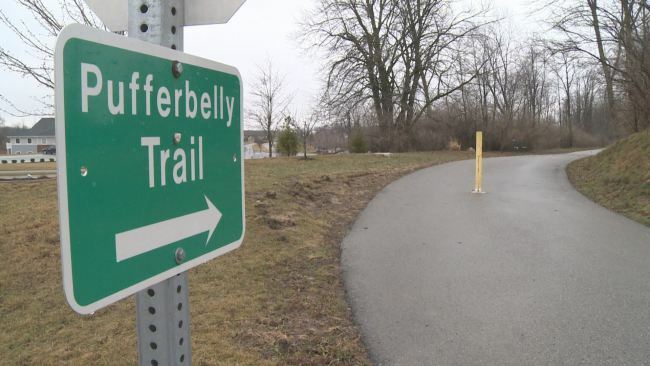 This trail is going to be within yards of the back side of Fort Wayne’s largest bicycle shop (Summit City Bicycle) so that will be great both for the shop and for bicyclists. Because this trail is far away from me and so short in length it is not practical for me to ride it. Like I said, hopefully someday it will be completed and will connect to other trails so that I can ride to it instead of having to drive to it and unload my trike to ride it like I do now. A 13 mile or so drive one way just to ride on one mile of trail isn’t too practical. 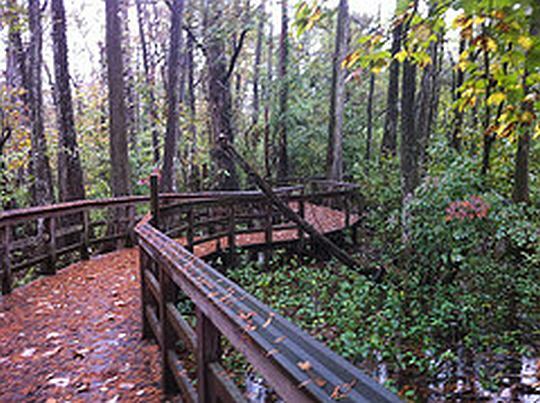 There is a real pretty swampy area alongside the trail. This picture doesn’t capture the beauty I saw today. 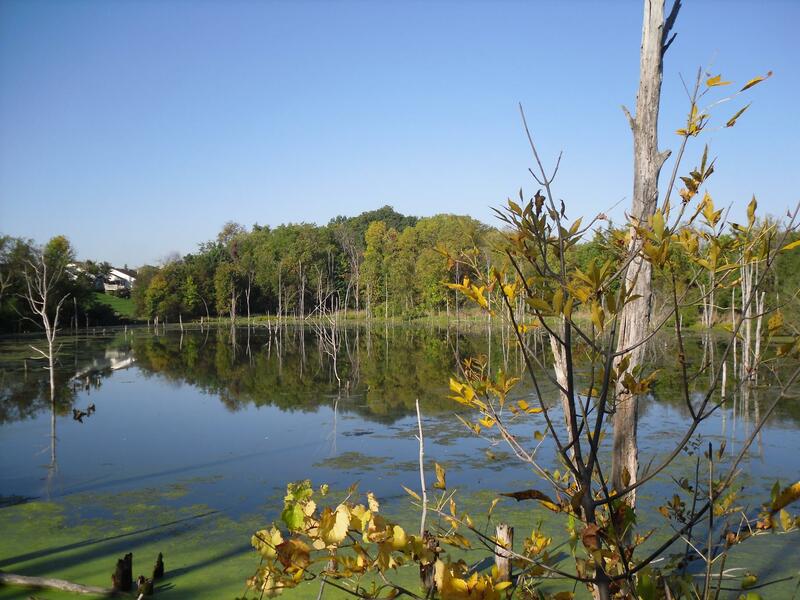 It will be getting even prettier as the Autumn change of leaf colors come on. There is a park bench there to sit on and take it all in. I got to thinking about all the beauty of nature the Lord Jesus Christ has created which we can enjoy. For those who live where there are 4 seasons there are some things unique to each season. 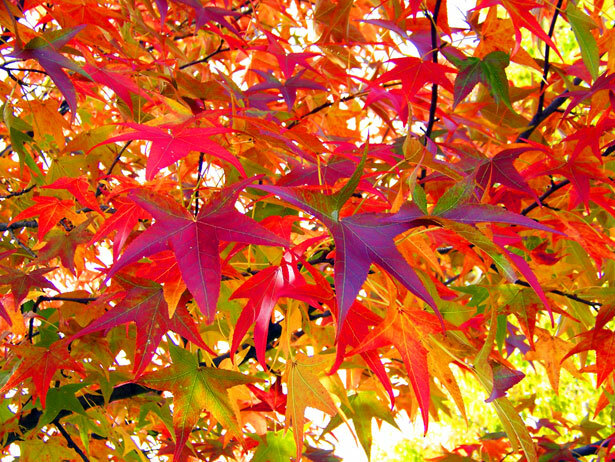 We are coming into the Autumn season and soon the leaves will be changed over to their beautiful colors. Of course, they will be falling and hiding the surface of the trails making it interesting, challenging and a bit dangerous to ride. When the front wheel goes off the edge of the trail because you can’t see the edge it can be all of the above. If your front wheel drops off the edge of the pavement be careful as you could wreck trying to get back up onto the pavement. 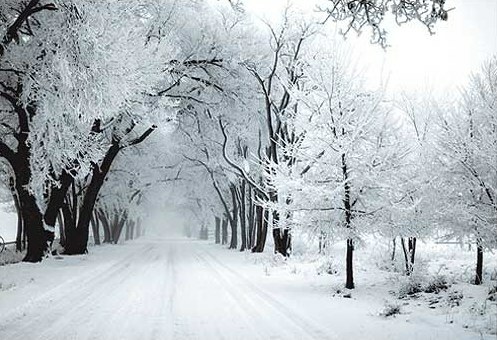 Following Autumn comes Winter for those who live in a northern climate. Snow is always pretty as are ice storms although I don’t wish the latter on anybody. Riding along under trees covered with ice is very dangerous as that stuff tends to come off and gravity brings it down on us. That could really mess up not only your ride but your day. Like I said, snow is pretty, but it sure isn’t any fun to try to ride thru, especially if there is any depth to it or if it is a wet heavy snow. The front wheels of a tadpole trike just don’t want to roll thru much more than 2 or 3 inches of light “dry” snow and the rear wheel loses traction pretty easily, especially if you don’t have some sort of winter tire replacing the standard tire. I personally use an aggressive knobby tire on the back during the winter. It makes a world of difference. 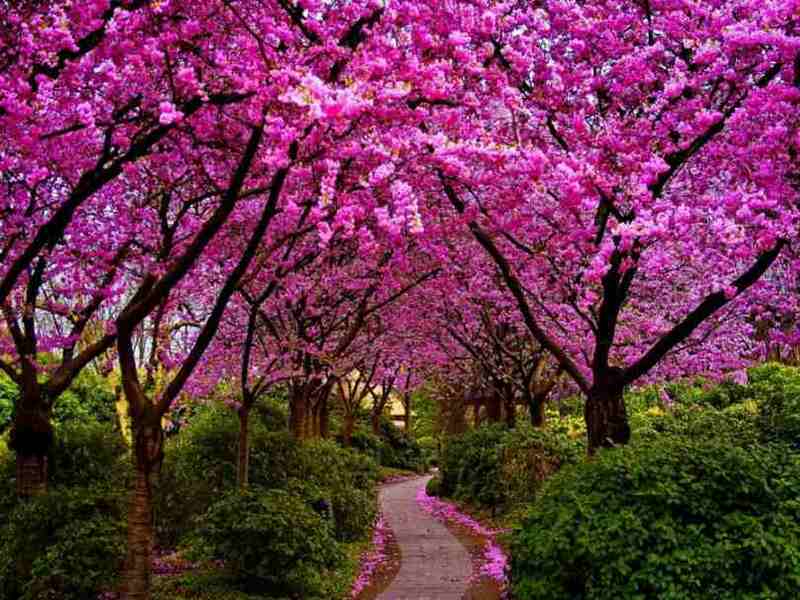 Springtime is up next with it new green buds and grass, pink and white blossoms, and other pretty colors. 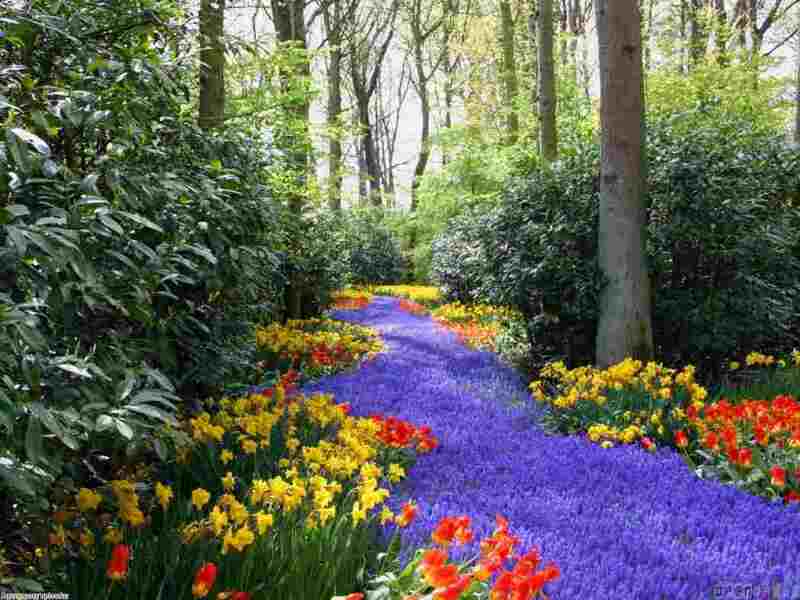 And sooner or later flowers come into bloom which are always pretty. Summer brings us full circle and usually comes all too quick as far as I am concerned. (I like a long Springtime and Fall but a short summer as I don’t like heat. It is even worse if there is also humidity. I couldn’t survive down in the deep South, especially Florida. It is bad enough here in northern Indiana.) Anyway, we have to deal with whatever weather we get. Summertime is usually quite green unless we go without rain for a long time and things brown and dry up. That’s not so pretty. Of course, the weeds are usually green regardless. 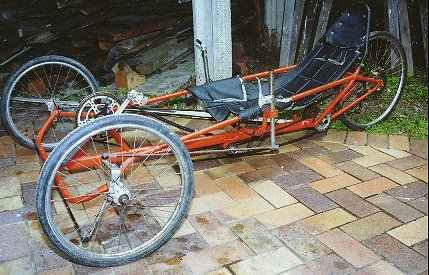 An 18 year old Malaysian boy decided to fabricate a tadpole trike. 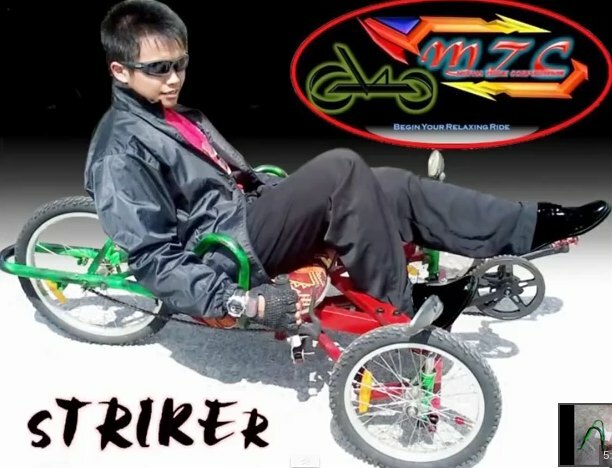 His story and the trike is featured in this YouTube video. 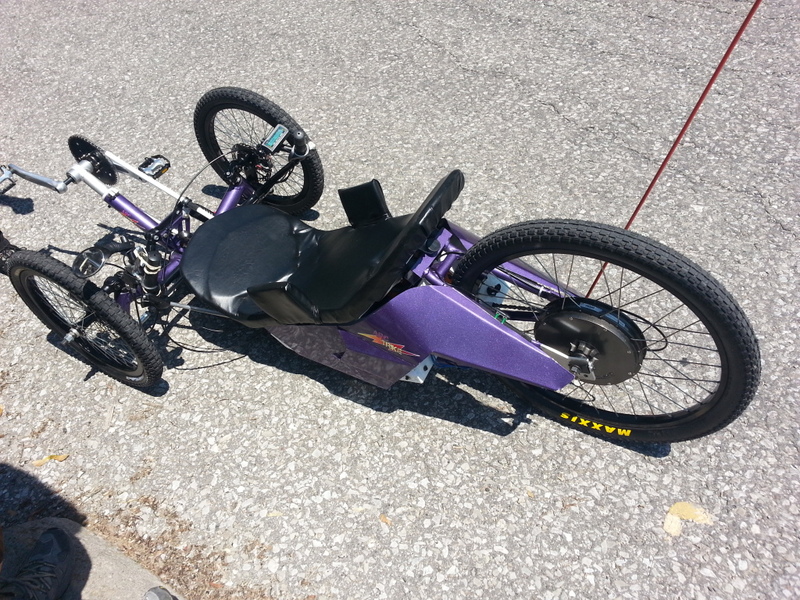 This video shows my journey how I begin my recumbent trike project. It’s starting from a school project, then I continue it as my personal project. Through the years, it has undergone many changes. Life is full of obstacles and while riding our trikes it no exception. Whether it be natural such as a fallen tree, a flood, etc. or man-made such as a barricade set up, a bollard, a kissing gate (how many of you know what that is? ), a detour or road/trail closed sign, or some other nifty thing placed in front of us … they all accomplish the same thing … slowing us down, making things more difficult, costing more time and effort, causing us to turn back having to give up progressing onward … at least on that particular pathway we are attempting to travel on. 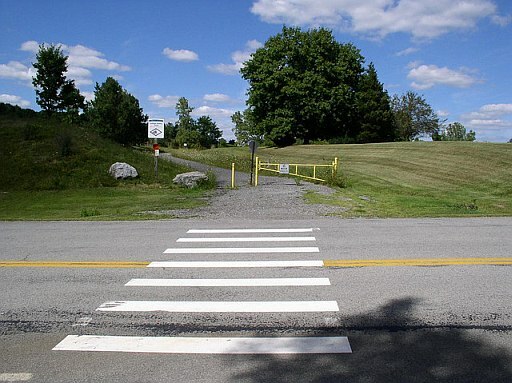 It is a lot easier for a person on foot or a bicycle to deal with this than it is for a trike rider. 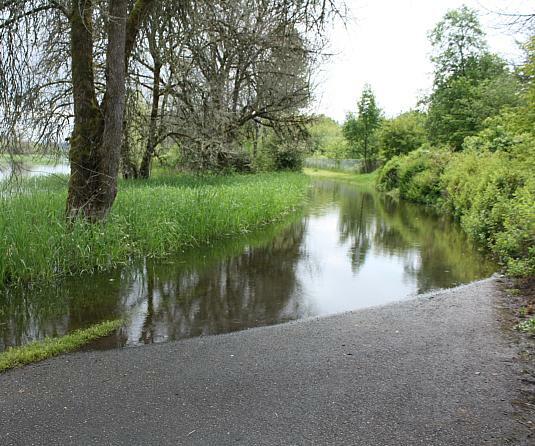 Encountering flood water and attempting to ride thru it can be risky business. It just may be deeper than anticipated and you can get a sitting bath. If the water is cold and/or nasty that isn’t so good. I speak from experience. 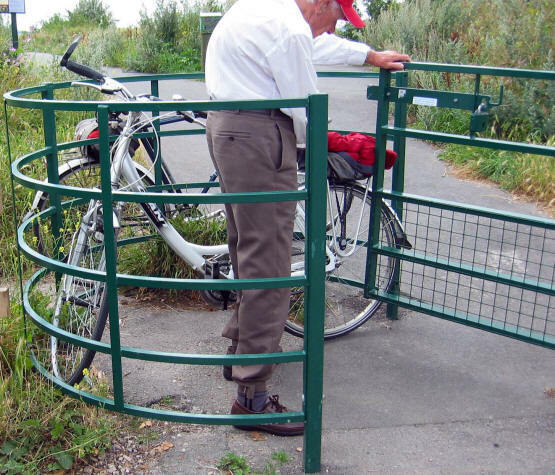 This is a kissing gate … try to get thru that on a trike. Some are made so you can, but this one above isn’t one of them. The one pictured below a trike can get thru, but just barely. These certainly are not very convenient. 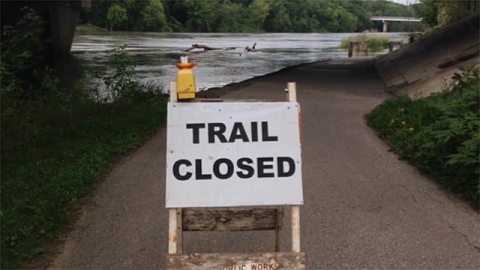 I see these signs a whole lot more than I care to … mostly due to trail flooding from the rivers they run alongside of. 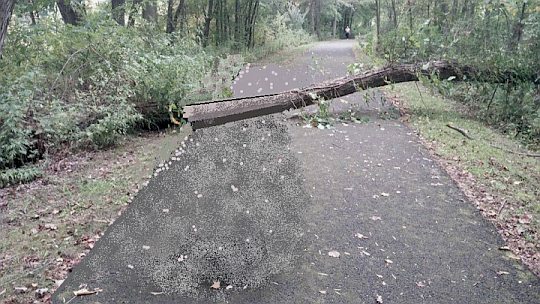 As a volunteer Greenway Ranger for our local trail system I report problems I encounter while out on the trails and many of them I take care of myself as long as I can. I cut and remove lots of fallen trees and tree branches. I like riding on the trails so I do what I can to help keep them open. As with nearly everything one could mention there is good and bad aspects of the various materials available to use to fabricate a tadpole trike. I am only going to talk about the three most common …. mild steel, chrome-moly steel, and aluminum. I am not considering carbon fiber or titanium since they are not very common and are expensive. Mild Steel — Two things immediately come to mind when talking about a trike made of mild steel — inexpensive and heavy. Perhaps a third thing pops into my thinking … entry level trikes such as … well, I guess I better not name names here. Most trikes are made of either chrome-moly or aluminum. There is nothing wrong with mild steel construction. It is strong (although not as strong as chrome-moly steel) and has some give and take to it which is good. By that I mean it offers some flexibility vs. being stiff and unforgiving. This makes for a better ride than material which is stiff and non-flexible. It is cheapest and easiest to weld and can be re-welded if it breaks. Mild steel can/will rust if exposed. Most people don’t want the extra weight involved so they stay away from mild steel. 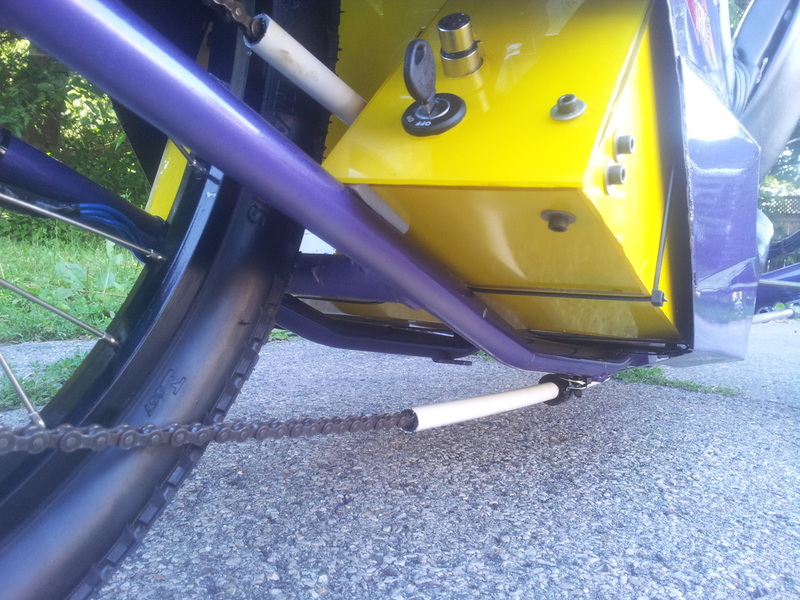 Besides most trikes made of mild steel come with lower quality components. Like I said, most are considered “entry level” trikes. A tadpole trike made of mild steel is generally about 7 to 10 pounds heavier than one made of chrome-moly steel or aluminum (although they can be heavier). I want to insert something here: Please do not misunderstand me. There is nothing wrong with a mild steel trike. However, they are not generally as popular as chrome-moly or aluminum. Those who manufacture trikes realize this and so the trikes they offer made of mild steel are lower cost trikes. To keep the cost down and sell them they obviously can’t and don’t use as high of quality components as higher priced trikes. It doesn’t mean that there is anything wrong with them. It simply means that the old adage holds true … you generally get what you pay for. If you want the best components on a trike you will pay more for them. Again, it doe not mean that the components used on a trike made of mild steel won’t provide years of good dependable service. 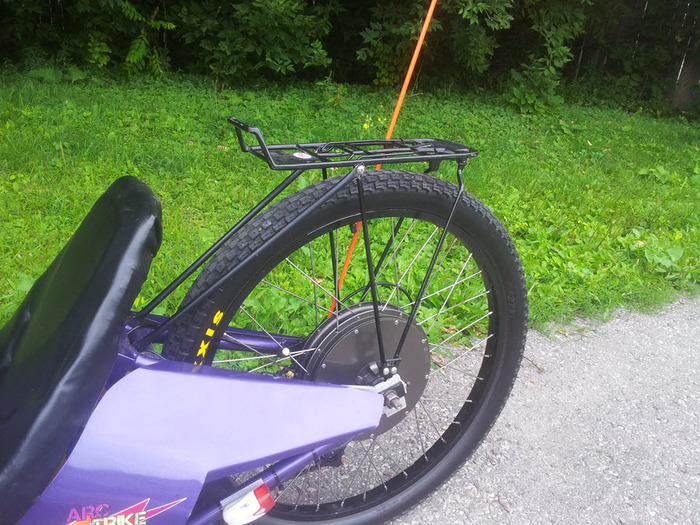 Originally the Catrike Trail trike came with lower quality components than what Catrike installs on this model now. Of course, the price of the trike was a lot less back then than what it is today. I have replaced all of the lower quality components with much higher quality ones since I bought it. Of course, in doing so I have spent a lot more money than what the original trike cost which came equipped with lower quality components. It was well worth the cost involved to upgrade to better components. 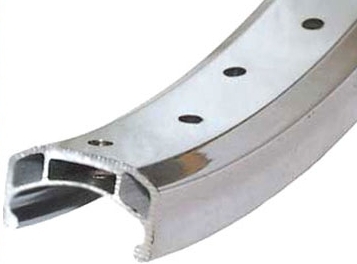 Chrome-Moly Steel — a very good choice as it is nearly as light as aluminum and is stronger. It also flexes some so provides a good ride. It is more expensive than mild steel and more expensive to weld. Welding chrome-moly steel is a specialty and can only be successfully done by a qualified weldor using special welding equipment. Chrome-moly steel can rust although not as badly as mild steel. Also the rust is usually only surface rust. Aluminum — the lightest of the three metals and most expensive. Like chrome-moly aluminum is also a specialty when it comes to welding. Aluminum is somewhat stiffer than the other two metals meaning that the ride will be slightly harsher. Aluminum is one material that dare not flex like the mild steel and chrome-moly steel. If it were to flex it would shorten its life considerably. As far as frame repairing goes, aluminum is not very repairable. After it’s welded, an aluminum frame must be heat treated. Once it’s been heat treated, further structural welding will weaken the frame. Sometimes very small things can be fixed, but if something crucial breaks or bends, the frame is done for. I personally would not let this scare me off. If the initial fabrication work was done correctly you should get long service out of an aluminum trike. 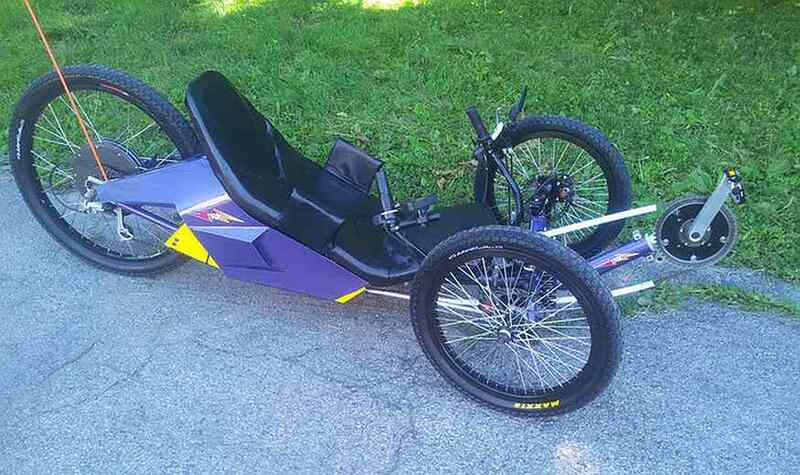 Catrike is a very high quality trike and made of aluminum. Alize, Catrike, TerraTrike and Sun offer a lifetime warranty on their frames. There may be others but if there are I don’t know of them. Most manufacturers offer warranties of a limited number of years such as 1, 5, 7, 10, etc. The fact that lifetime warranties are offered on aluminum frame trikes speaks of their expected service. Manufacturers would not offer such a warranty if they expected to have to replace a lot of frames. “It depends on the way the frames are made, including the exact steel(s) used [there are many different steels, with widely differing properties, ultimate yield strengths, corrosion resistance, and fatigue limits], the tubing diameters [other things being equal, larger diameters will usually be stiffer and more durable], and the wall thicknesses [very thin-walled steel frames are often not particularly durable]. The same sorts of things can be said for aluminums and various types of aluminum tubing. Some aluminum frames will far outlast most steel frames. Some aluminum and steel frames will be about equal in longevity. Some steel frames will far outlast most aluminum frames. There are strong, well built aluminum frames that can easily last a lifetime. Rider weight, strength, and riding style have a lot to do with it. What causes most frames to fail eventually is repeated high stresses. A 120-pound rider who has a gentle riding style, and rides on smooth roads, can make a frame last for centuries. 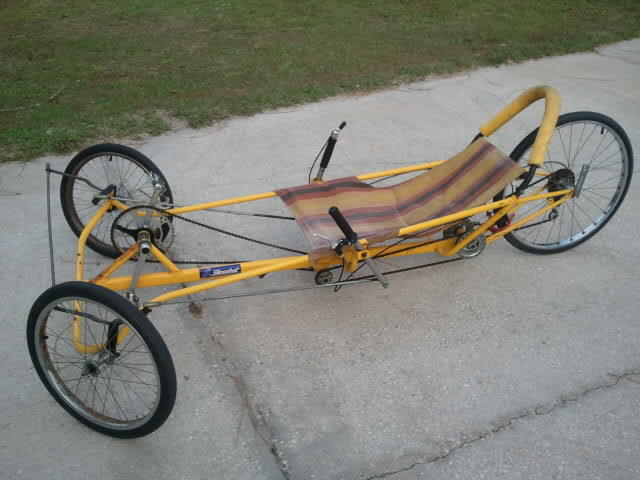 Many homemade trikes are made of mild steel since it is easy and cheap to work with. I made my first tadpole trike and I made it out of mild steel. It was fine, but it most definitely was quite heavy. Most trikes are made of one of these metals. The better ones are made of either chrome-moly or aluminum. Mild steel just doesn’t seem to be very popular when it comes to tadpole trikes. As I was reading while writing this article I read on a forum where someone was asking about using JB Weld epoxy on an aluminum bike frame to repair it. I had to laugh although it certainly would not be funny when it failed and something bad resulted. As a professional weldor with over 55 years experience and the highest certification obtainable in manual arc welding (my main interest was always repair welding) I had my own welding business for over 25 years before retiring. Many times customers came to me wanting me to repair weld some item that they had tried to use JB Weld on before bringing it to me. I have used JB Weld myself numerous times. It is a good epoxy but it certainly is not the same as welding and I think they chose a very poor and misleading name for their product which is sad as so many people buy into it thinking it will perform miracles so to speak. The truth is it is about worthless for many of the things people try using it for. 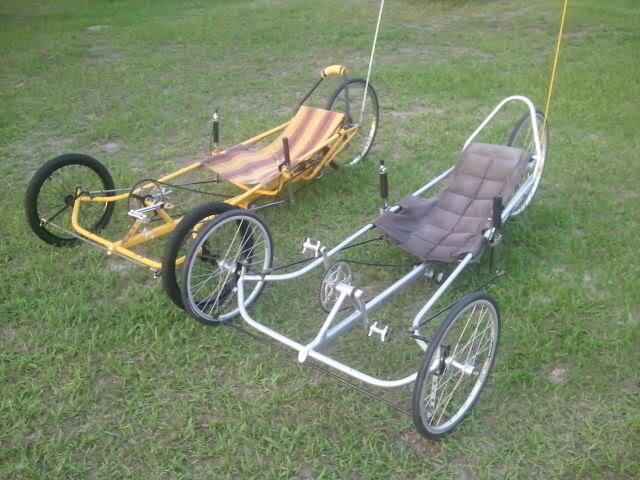 As to the concern over weight … on comparable trikes, one made of aluminum and the other made of chrome-moly steel, the latter will probably weigh 2 to 3 pounds more than the aluminum one. So it is not a significant amount. One factor to consider for those who care about such things is that whenever there is flexing there is a loss of efficiency. 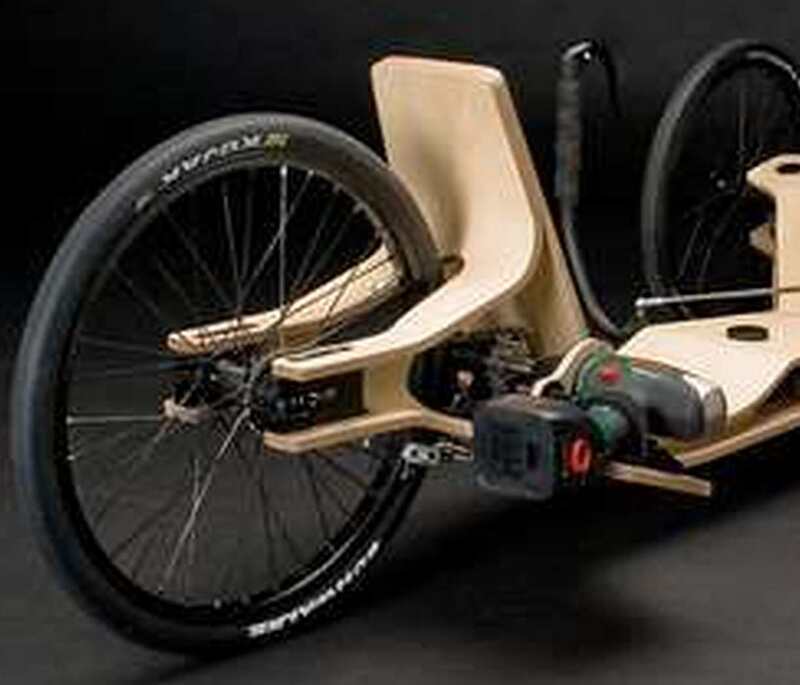 Whether it be boom flex, seat frame movement or anything else it makes a difference. 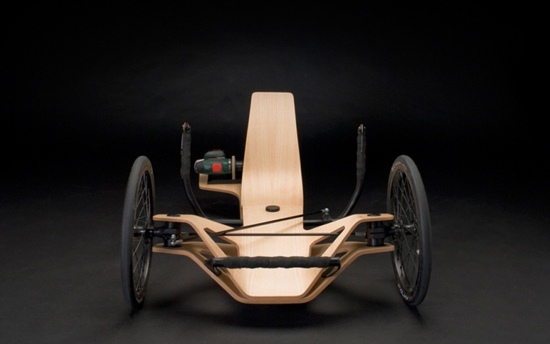 The less flexing or movement of the frame (including the seat) the more effective pedaling along will be. Speaking of boom flex this can be quite noticeable in some trikes. 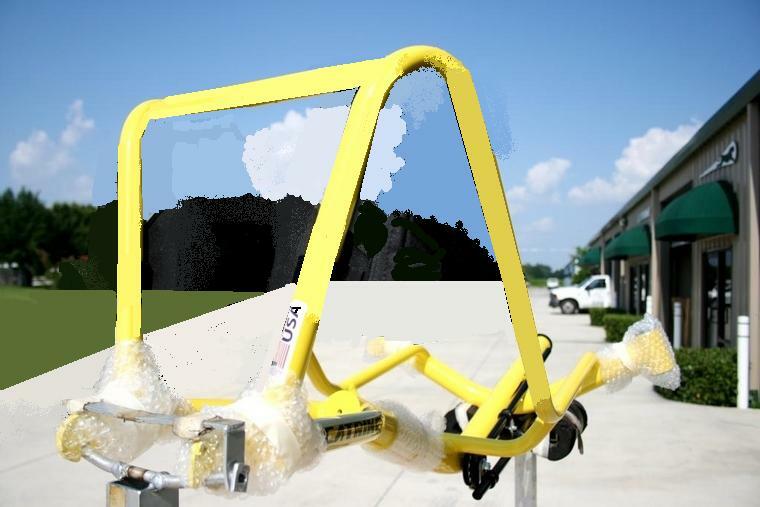 Catrike has the best designed boom in the trike industry. They have engineered their boom so that it has very little flex. It has internal reinforcement built into it. It is patented. Anyone who would like to read more about the metallurgy information click HERE , HERE and HERE. There are many websites one can check out on this subject. HERE are the Google search results for the topic. Truly it is very much a science and many various factors come into play. I mean just how many chuck holes can a trike hit and remain unscathed? I already mentioned making my first tadpole trike and that I made it out of mild steel. I then bought a new Catrike Trail which, of course, is made of aluminum as are all Catrikes. I readily admit that I am prejudice. I don’t think there is a better tadpole trike made than Catrike regardless of the price paid. I know others who have other brands and all I can say is “thank you Catrike” … I prefer mine over any of the other brands. 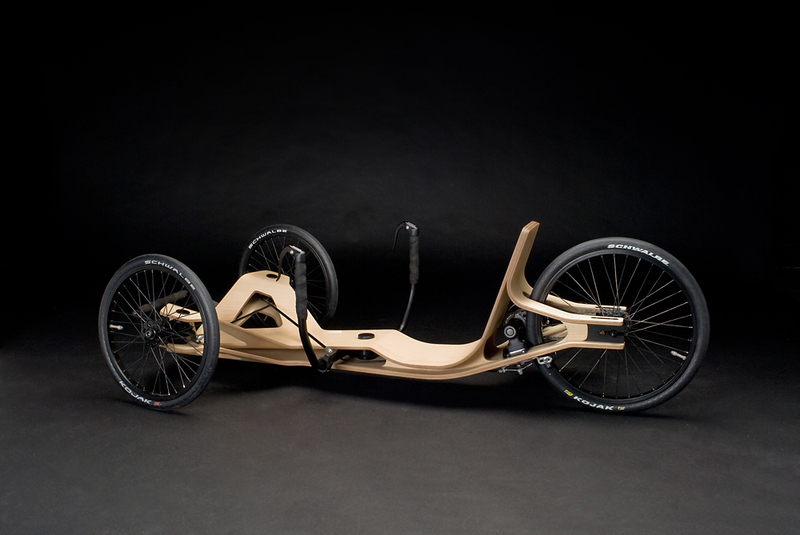 I think Catrike is better engineered and are top quality thru and thru. I am not pleased with some of the decisions at Catrike which have been made in more recent years. 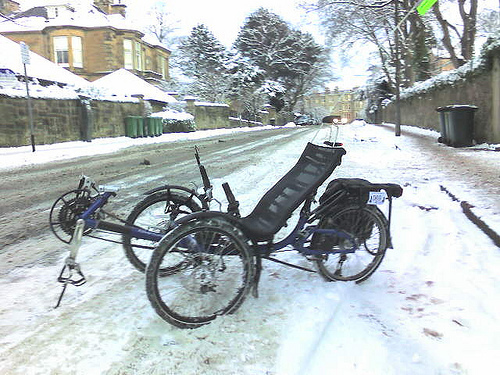 I am mainly referring to the fact that the Catrike Trail model is no longer the same trike it was when I bought mine. The frame design has changed from their fabulous one piece simple design (known as “space frame”) to one with an adjustable seat back and a redesigned rear frame all of which adds two more pounds of weight. And now they don[‘t even offer it in anything other than their new folding design which is even heavier and more expensive. It kind of reminds me of the Ford Thunderbird. It started off as a sports car and ended up becoming another Detroit barge. Oh how I wish Catrike still had the trike I originally bought. Well, I guess they are going to do whatever they are going to do. But I sure miss what they first offered as I think it was by far the best design of them all. And not everyone wants or needs a folding trike or an adjustable seat back. Every time I go riding I ride with Arthur Itis. You may not know him personally (I hope you don’t), but I rather imagine you have heard of him as he is quite well known. Ol’ Art is no friend of mine, but he is my constant companion. I really don’t like him at all and I would much rather ride without him, but alas, I have not been able to get rid of him. I have had bad knee joints for many years now and weight bearing activities are not part of my capabilities. Riding my tadpole trike is about the only form of exercise my knee joints can handle and even this is not without some pain and limitations. I find that I can usually ride about 19 to 24 miles before my knee joints start communicating with me. Even so I often can ride 35 miles or so without too much of a problem. I also have some arthritis in my neck which necessitates my using a head/neck rest when I ride. There are two things I want to share with readers concerning riding and living with bad knee joints. 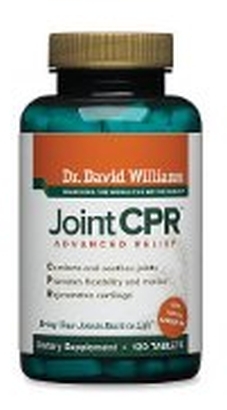 First, I use a supplement called Dr. Williams Joint CPR. I have been using his joint supplements for several years now. I have tried several others but none helped much. This product I highly recommend as it is quite effective. Both of my knee joints are bone on bone and so bad that most people could not walk or function. But taking this supplement I am able to walk and function fairly normally. I just can’t remain up weight bearing for long periods of time. 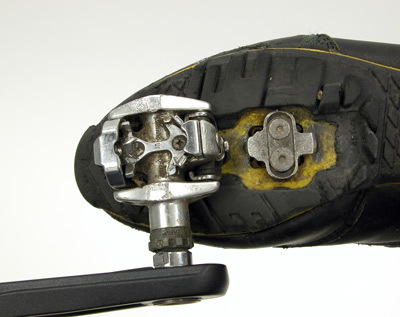 The other thing I have discovered fairly recently is that using SPD shoes/sandals and pedals helps as I can get some relief by pulling back on the pedals instead of pushing down on them. I only do this briefly but it does seem to help. for just as long as I can and like I do with everything it is a matter of “one day at a time”. Spokes are quite small and not very impressive as being strong. After all, you can take one in your hands and easily bend it. Yet when several are used together they provide incredible strength. Therein lies the key … strength in numbers … all working together. And that is why it is so important that they remain working together. When spokes start getting loose or breaking the strength factor is greatly effected. Once a spoke gets loose it can lead to other spokes loosening. And once a spoke breaks it can easily lead to other spokes breaking as well. Of course, the result of all of this is wheel alignment gets off initially. Eventually much worse can result up to and including major failure and a wreck. Wheels should spin straight and true. The wheel should be round vs. having flat spots, oblong, etc. The spokes come in varying types, sizes and materials they are made of. They make spoke guages to check the diameter of the spoke so you can know what size spoke is needed when replacing them. 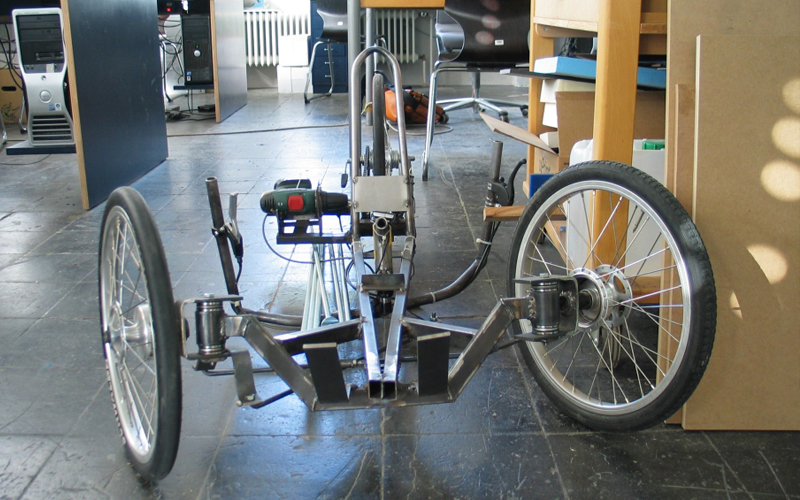 On a tadpole trike the wheels have to be quite strong due to the side (lateral) forces they undergo in hard cornering. Double wall wheels are normally used as they are considerably stronger than single wall construction. The spokes in a wheel are laced in a particular pattern and it is quite important that this pattern is maintained when replacing broken spokes. 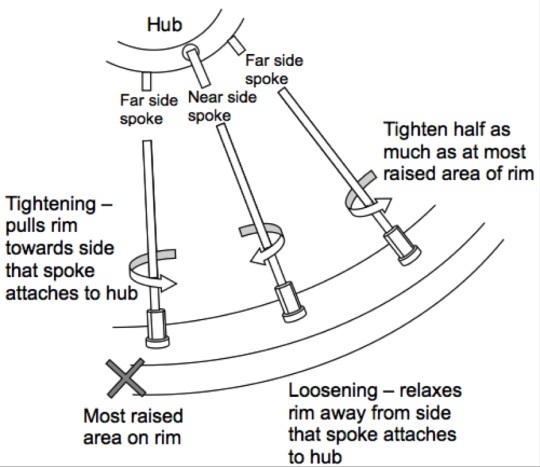 So be careful to observe the pattern and install the spoke(s) properly. 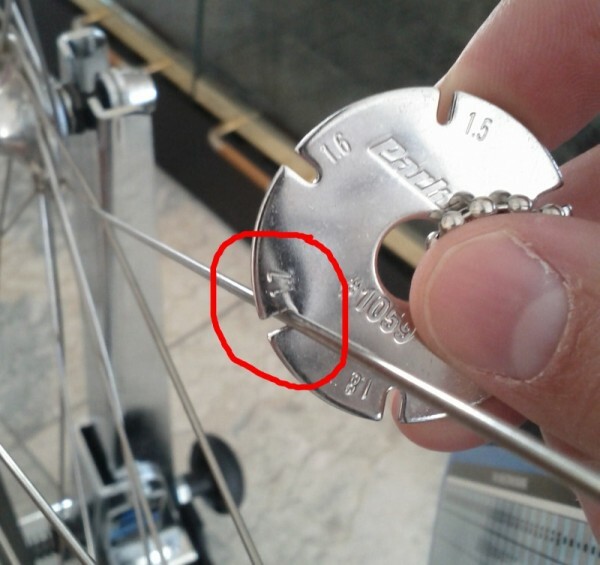 If this pattern in not maintained things can get off when the spokes are tightened to their proper tension. The spokes must be fed in from the correct side and cross the other spokes correctly. Oftentimes when just replacing one or a few individual spokes it is necessary to bend them some to get them to go where they need to. Try to be careful not to bend them too much and try to straighten them back out once they are in position. As long as they are relatively straight they will work fine as far as retentioning them and having them function properly. Note: If you hear a clicking sound while riding and it changes in frequency as you speed up and slow down it might be a broken spoke you are hearing. They can be hard to spot so simply take your hands and check the spokes by squeezing two spokes together. When you come to a loose or broken spoke you should easily be able to detect it. Even if no spokes are broken sometimes there can still be a clicking noise being made by a loose spoke. Purchasing spokes at a local bike shop is fine and I most definitely believe in supporting them. 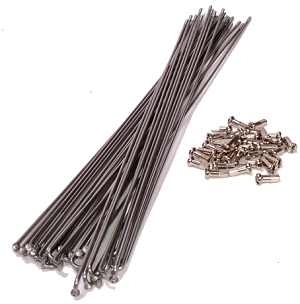 However, if you find yourself replacing lots of spokes it can get expensive buying the spokes at a local bike shop. I ordered a package of 50 online for less than it cost me for just a few at a local bike shop. 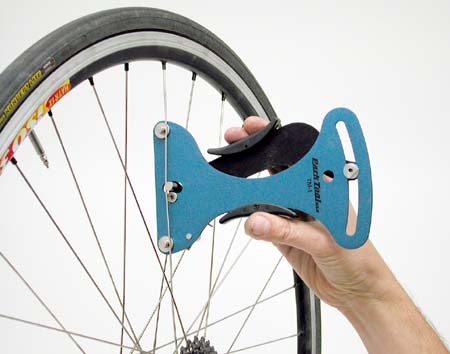 There are special tools and equipment available to do the work involved in truing a wheel and adjusting the spokes. They can get pretty expensive, especially a wheel truing stand. I have never had one and they really are not needed although they are nice and handy. It is easy enough to true a wheel on a bike/trike. All one really needs is a good spoke wrench. I say good because there are some out there which are not worth buying. It pays to buy good quality bicycle tools (any tools for that matter). Be sure to buy and use the right size spoke wrench as there are different sizes. When tightening or loosening spokes just pretend like you are a nut. (That shouldn’t be too difficult for many of us.) 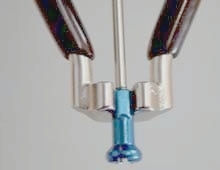 Visualize the nut as it is threaded onto the spoke. Looking down on the nut and the spoke from the top side where the nut goes thru the wheel (rim) the thread is always a right hand thread so that means it turns clockwise to tighten it and counterclockwise to loosen it. 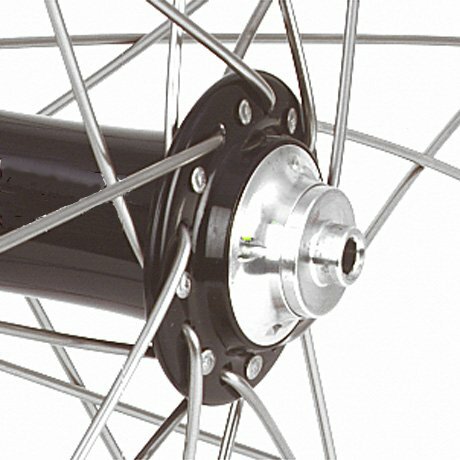 The spokes are laced from both sides of the hub staggered so that as each spoke is tightened or loosened the wheel (rim) will move one way or the other. In the image below this is illustrated. One needs to be careful when adjusting the spokes as it doesn’t take much to really mess up the wheel alignment. This can involve pulling the wheel (rim) over too far to one side or “flattening” it so it is no longer round. As to the matter of spoke tension they make various kinds of tools to check the tension. However, I caution you before purchasing one (like I did) and wasting your money (like I did) unless you have a 26 inch or 700 wheel in the rear these tools won’t do you any good. A 20 inch wheel is too small for them to fit in. I don’t have any advice for others concerning getting the tension correct other than to say two words … “uniformity” and “experience”. YIKES! WHERE DID HE COME FROM? 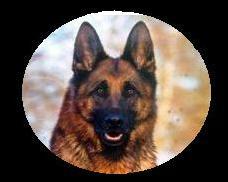 … a big German Shepherd dog running along and he was already quite close and getting closer quickly. Needless to say I was a bit concerned for my personal safety. Being seated only about 9 inches or so off of the pavement means that we are far more vulnerable than we would be on an upright bicycle. As it turned out he was a very friendly dog and just coming out to greet us. WHEW!!! That was a relief. He ran along with us for a little ways before I told him he needed to go home. Much to my surprise and delight he did. Good doggie! He even minds strangers. There was another large friendly dog that used to live at that same house. He would also come running out to greet us, but he wouldn’t go home upon our telling him to. He would run along with us for a couple of miles before stopping at another house to visit. I don’t understand people allowing their pets to wander off like that. I would not be surprised if he eventually got killed out on the road. One dog that comes to mind is also quite large. The first time I encountered him he came running right up to me from the side. I sensed that he was friendly so I stopped to interact with him. The next thing I knew he was up on my lap. That was a bit awkward and most certainly unexpected. His feet were muddy so he messed up my clothes and arms. He definitely was way too large to be a lap dog. There are other dogs we sometimes encounter which are not so friendly and we are always concerned about when they are allowed to run free and come charging at us. Fortunately we have not yet had any problems, but it is scary. I used to carry a can of Halt repellent spray with me and kept it quite handy. I never used it, but it gave me some sense of comfort. My one friend I ride with told me I should never use it on a charging dog as all it will do is make him mad and more of a problem to deal with. He used to be a mailman and the post office issued this same brand of spray to them. The postal delivery people I have spoke to have confirmed what my friend says. So I no longer carry it with me. 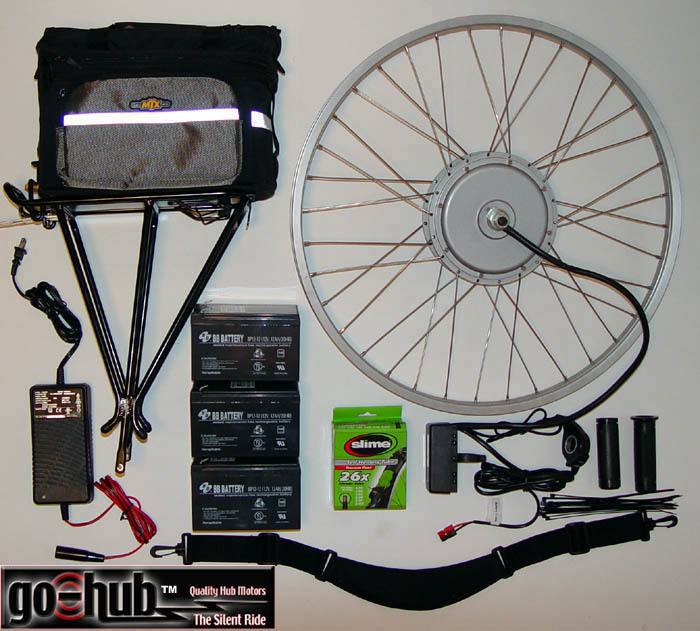 Go-Hub … is a kit which can be purchased to motorize a tadpole trike. What is unique about it is that it offers “REVERSE”. That’s something we talk about, but this is the first I have actually heard of it. You can check it out in more detail HERE. Now that I am looking into this I just found another one which claims to offer reverse. HERE is a link to it. And then I found … How to make a hub motor reverse. 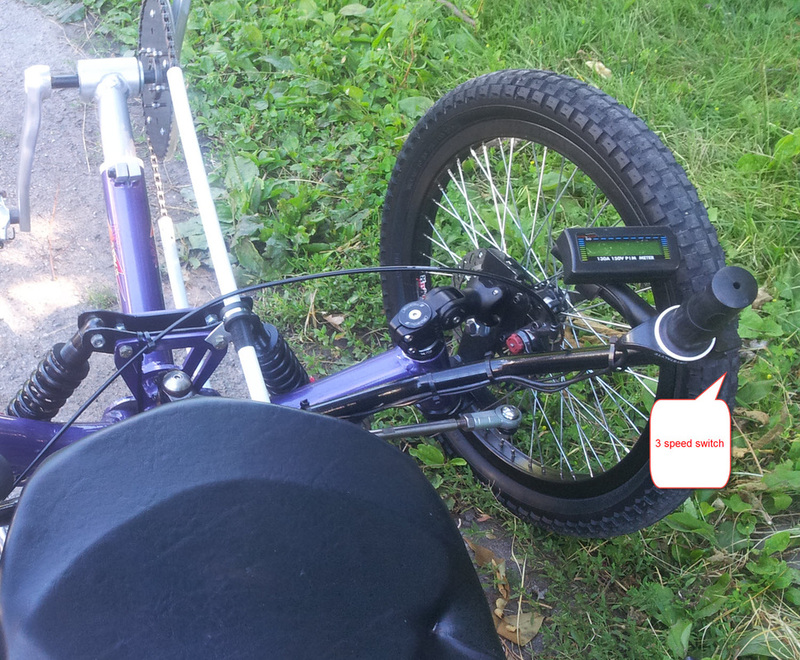 How to install an e-trike kit. So far what I am finding it all DIY approaches. So I am wondering … does anyone manufacture an e-trike with reverse? I will let you know if I find out anything. If you know anything about the matter please let me and others know by commenting or emailing me. Thanks. I have added another page to this blog which lists tadpole trike models by their price. I did this to make a handy tool available to those who have a limited amount of money to spend (or have in mind to spend a certain amount) to buy a tadpole trike. The page shows the models available within a certain price range and they are listed in $500 increments. HERE is a link to that page. If you notice any trikes not listed please feel free to bring it to my attention. Thanks. Questions and Answers … Yep, you’ll have that … questions that is. And that brings me to my next point … are you an ambassador for tadpole trikes or more of an embarrassment? We are going to be asked questions as tadpole trikes are neat and catch the attention of others. I will be the first to admit that some questions we get asked are rather ridiculous and a bit frustrating to deal with. Probably one of the worst is … “Is that thing comfortable?” I mean … there we are sitting down leaning back looking like we could easily fall asleep and someone asks that question. I will admit that I have not always been a good ambassador for tadpole trikes in responding to some questions I get asked. Sometimes the right and proper answer does not always come to me immediately. Sometimes I have answered the question with a question. For example, when asked, “Is that thing comfortable? I have come back with “Does it look comfortable?” But I think the best answer to that question is simply to say “Yes, it is very comfortable”. Q) How fast will that thing go? A) As fast as you can pedal it. Q) How do you steer that? A) With the handlebars. Q) How much does one of those cost? A) More that the car you drive. … or … If you have to ask you probably can’t afford one. Q) Where can I get one of those? A) From a store that sells them. 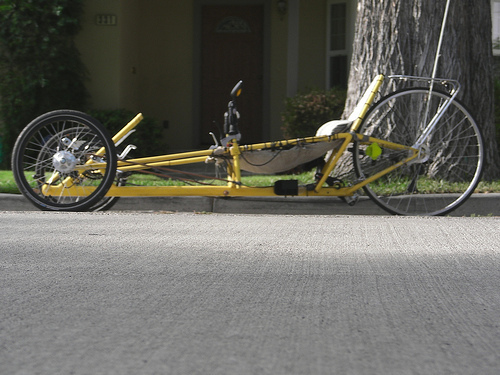 Do we take the time and put forth the effort to talk to people and answer their questions about tadpole trikes? Or do we give one of these quick answers to get on our way knowing that we were not really helpful and certainly not being a good ambassador? Depending upon the questions asked it usually doesn’t take all that long to give a sufficient helpful answer. Most people are really all that serious about getting deep into discussion about tadpole trikes. Most people are satisfied with relatively short answers as long as they are helpful and politely answered. For instance, when someone asks me how much a tadpole trike costs I usually tell them that they can be purchased starting at around $700 up to about $12,000. If they want to know more beyond that I take the time to talk to them more. Most people are satisfied with that answer. Hey, seriously … we do need to be good ambassadors out there. Just a little difference in horsepower here between Big Daddy (above) and Junior (below). 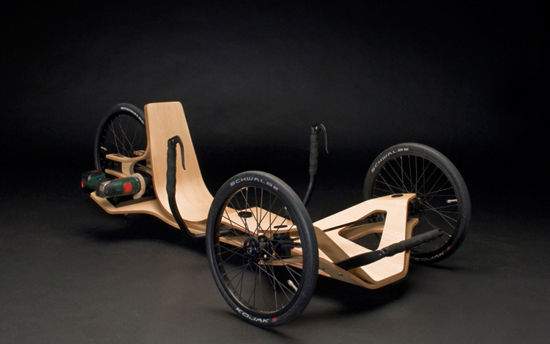 It’s not a tadpole trike, but it is a recumbent quad. I doubt very much if you could pull wheelies or smoke tires with this, but I am pretty sure you would get a lot of attention. Isn’t this sharp? 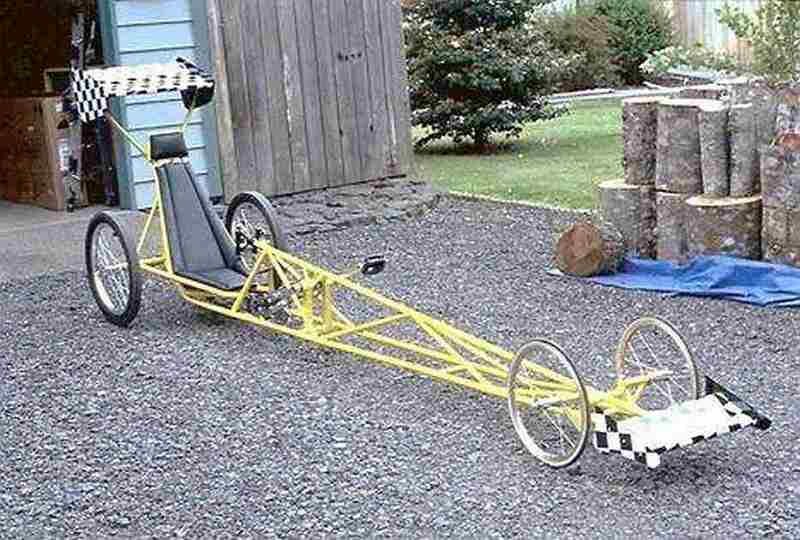 As long as the slingshot dragster is it would take up a lot of floor space storing it. And I don’t think it would handle sharp turns very well. Never the less, I think it would be a blast to take out on a local trail. 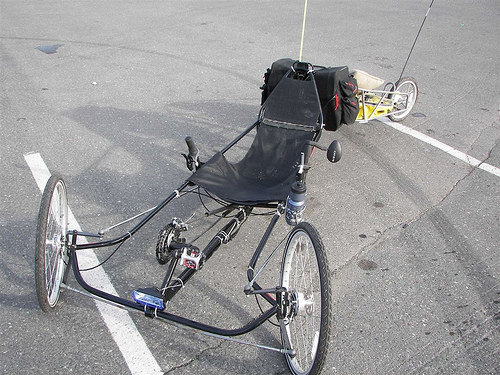 Well, it is a trike and it is a recumbent, but that is about the end of commonly used descriptions for this vehicle. 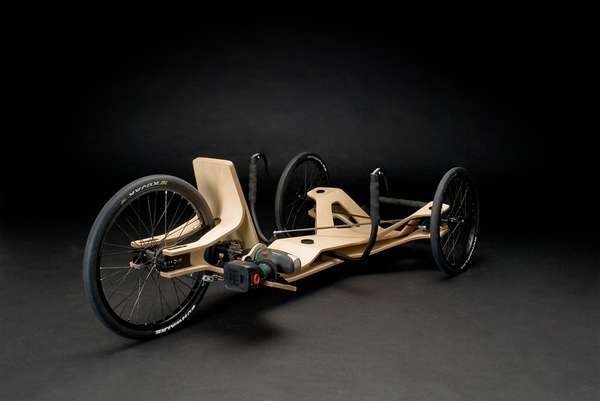 It is not human powered … there are no pedals or anything else such as hand powered. Nope, this is powered by a Bosch portable electric screwdriver. It has a top speed of 15mph that lasts for ten minutes on a single charge. 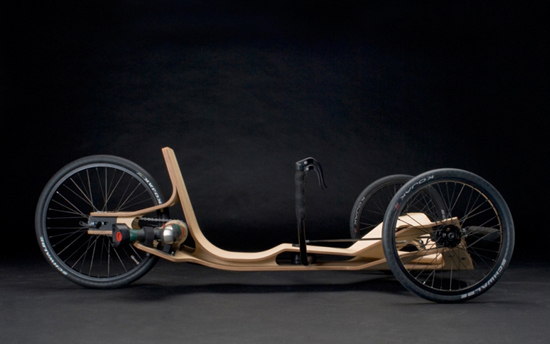 It is mostly constructed of custom bent plywood and aluminium other than the wheels, handlebars and steering linkage. The Rennholz was designed and prototyped during the space of ten weeks. Created by Jirka Wolff, Andreas Patsiaouras and Marcel Heise, a team of German student designers for the annual “Akkuschrauberrennen” competition held by the HAWK University of Applied Sciences and Arts in Hildesheim, Germany, the Rennholz presents a “serious vehicle concept [for] e-mobility.” The Rennholz has been specially designed to take part in the HAWK Hildesheim’s bi-annual race. Rennholz means “race wood” in English. I know absolutely nothing about this trike other than what I have shared here so please don’t ask me questions about it as I can’t answer them. This is just something I came across and thought I would share here on this blog. HERE is an article I found online about it. and at best is in limbo. The website has been taken down. With the growing popularity of tadpole trikes comes new companies offering various products. One of them is Arctrike. They make a nice looking and sporty trike. The really great aspect of their trikes is that the trike is built as an electric motorized trike … not taking a tadpole trike and motorizing it. That means it is built heavier duty to hold up to the extra demands and stresses put on it. Arctrike is headquartered in London, Ontario (Canada). They presently offer 3 models ranging in price from $5300 to $5700 to $6250. With each model the range of travel on a battery charge and top speed increase as does the price. All models are 7 speed. Hey, with a motor you don’t need 30 or whatever. 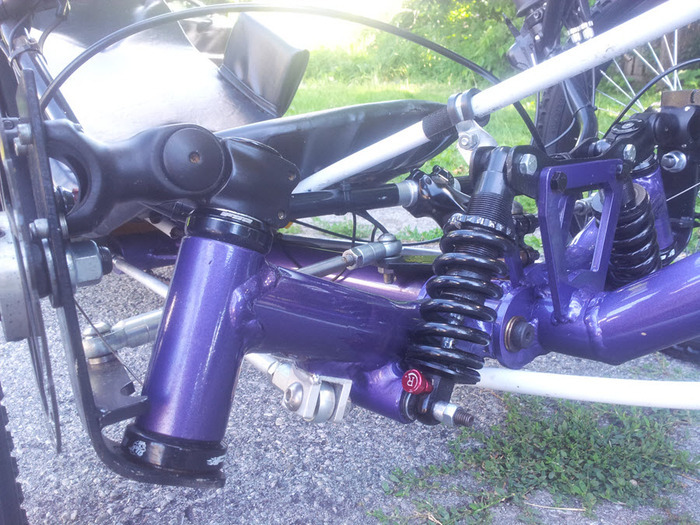 All models have front suspension. For $6250 you can “fly” 75 kph (46.6 mph). Compare that to the 28 mph top speed of an $8000 German competitor which will go unnamed. 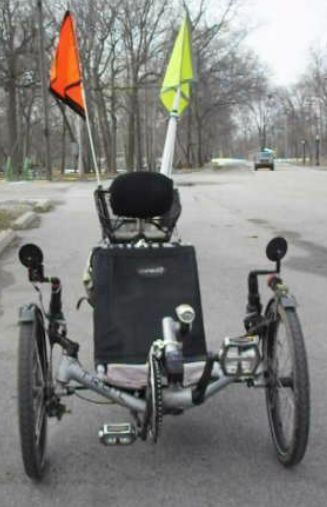 A high powered headlight and taillight will come with the trike as will a headrest. Phase 3 model will come with a rear rack. There is a 3 year warranty on the frame and frame components. There is a one year warranty on the batteries and motor. The quality of the frame and components as well as the electronics gives us the confidence to say that you probably would never need to use it! The batteries are Lithium Ion. They are composed of Headway Cells. 3.3 volts and 15 amps per cell. They are top quality and are the latest in battery technology. The have a lifespan of proximately 2000 charges after which they are reduced to 80% capacity and then they will go another 1000 charges!!!. They can also be charged in a quick 2.5 hours from totally exhausted. The rear motor is the famous Crystalyte HS3540 rear hub motor. 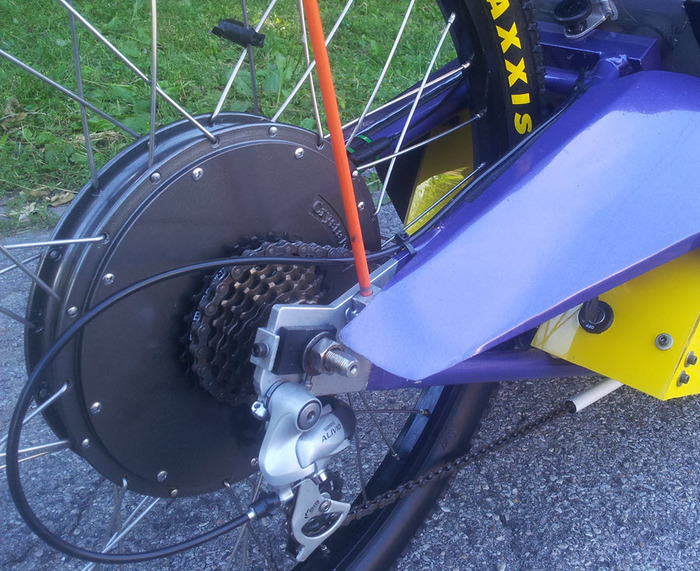 This motor is used extensively by high end bikes such as the Stealth fighter and the Picycle. It is reliable and robust. We are using the non sensored version for ultimate reliability. Combined with the specially modified Lyen Controller it only requires a fraction of an inch of movement before the throttle kicks in. 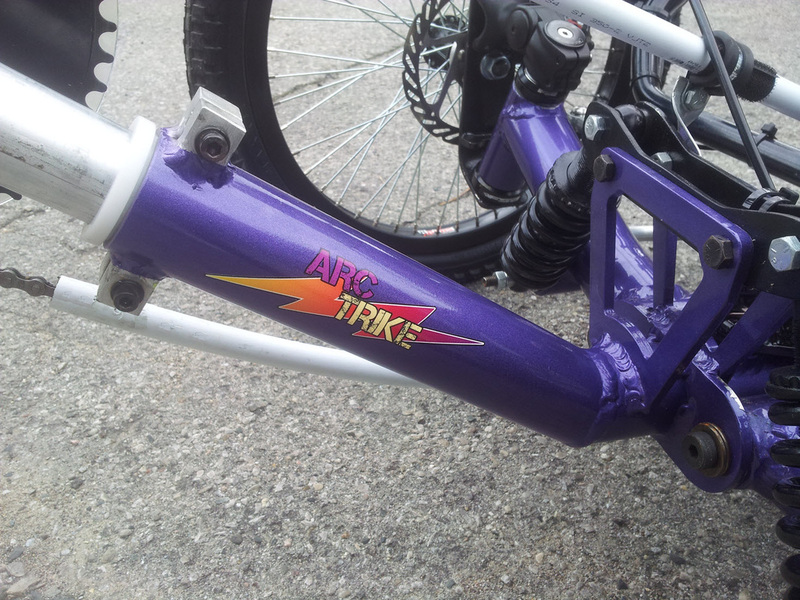 Arctrike offers the following colors: purple, orange, red, yellow, green, white & black. If you like watching videos HERE is a playlist of the YouTube videos the designer/builder has posted. NOTE: The manufacturer has been providing additional information via comments so I highly recommend that you read the comments.